Make family adventures with the New 2019 Forest River R-Pod 180! This Travel Trailer was built for long, comfortable trips! At TerryTown RV, we have a massive inventory of RVs with incredibly low prices, just one of the reasons why we're one of the best Michigan RV dealers! Stop on by 7145 Division Ave S Grand Rapids Michigan 49548 or call us at 616-455-5590 to talk to an RV expert today! Food always tastes better when you're camping, doesn't it? And the full kitchen in this RV comes with a bevy of modern cooking appliances, including a 2 burner range cooktop that's perfect for whipping up bacon and eggs, flapjacks, sausage links, hamburgers, fish, and more! Store all your fresh foods and cold beverages in the 3.70 cu. ft. refrigerator! The 36 gallon freshwater tank provides enough clean water for the entire vacation! Skip the communal bathroom! 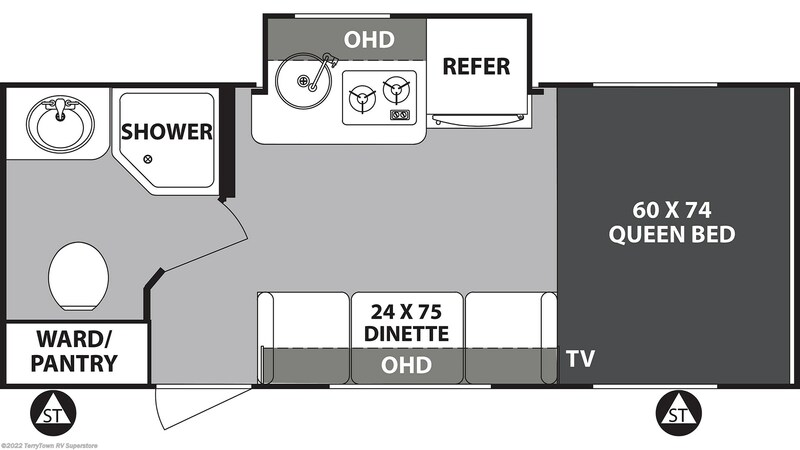 This RV's bathroom has a Foot Flush toilet and a shower heated by 20 lbs. of LP tank capacity. There is a 30 gallon gray water tank and a 30 gallon black water tank. Check out Stock # 36468 - 2019 Forest River R-Pod 180 on forestriverrvsource.com!